Sunday November 6th 1898 I hurried the work this morning and were ready to start up home before nine oclock. We all ate dinner at Otts. Hattie and I took Edith down in our buggy. She felt much worse after dinner that they took her back home. We came home before it was very late. I read in the evening. 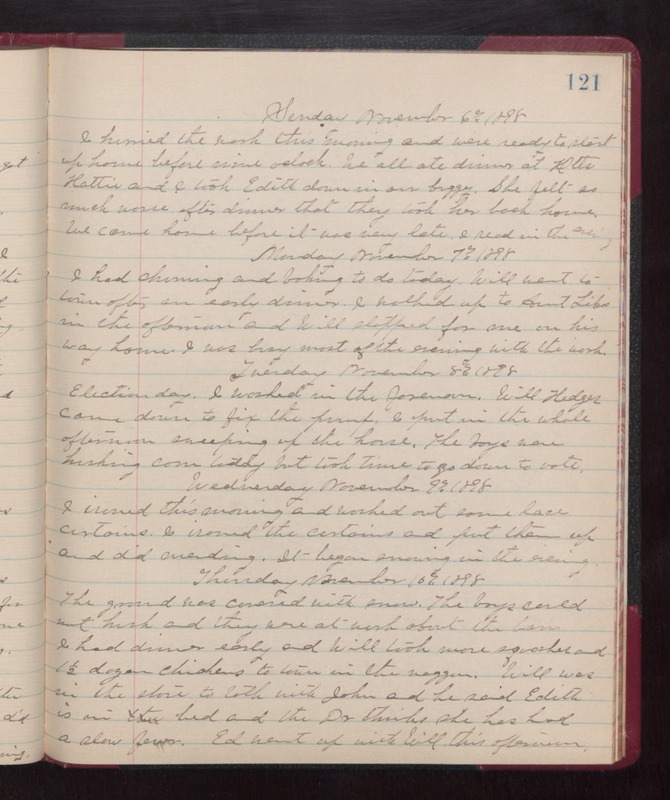 Monday November 7th 1898 I had churning and baking to do today. Will went to town after an early dinner. I walked up to Aunt Libs in the afternoon and Will stopped for me on his way home. I was busy most of the evening with the work. Tuesday November 8th 1898 Election Day. I worked in the forenoon. Will Hedges came down to fix the pump. I put in the whole afternoon sweeping up the house. The boys were husking corn today but took time to go down to vote. Wednesday November 9th 1898 I ironed this morning and washed our some lace curtains. I ironed the curtains and put them up and did mending. It began snowing in the evening. Thursday November 10th 1898 The ground was covered with snow. The boys could not husk and they were at work about the barn. I had dinner early and Will took more squashes and 1 1/2 dozen chickens t town in the waggon. Will was in the store to talk with John and he said Edith is in bed and the Dr thinks she has had a slow fever. Ed went up with Will this afternoon.